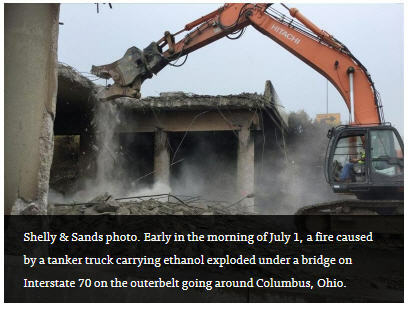 Early in the morning of July 1, a fire caused by a tanker truck carrying ethanol exploded under a bridge on Interstate 70 on the outerbelt going around Columbus, Ohio. 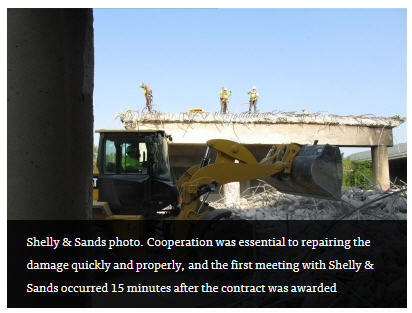 This required emergency work to be done to repair the bridge and adjacent ramp — a $1.186 million Ohio Department of Transportation (ODOT) contract that went to Shelly & Sands Inc. (S&S) a day after the incident. The bridge repair work was done in 18 days and reopened to traffic on July 21. Firemen from the Columbus Fire Department put out the blaze, which started around 6 a.m., in two hours. ODOT personnel were only able to access the site at 1:30 p.m., nearly eight hours after the incident, when the site was deemed to be safe. The fire reached a temperature of 1,800 degrees at its peak. 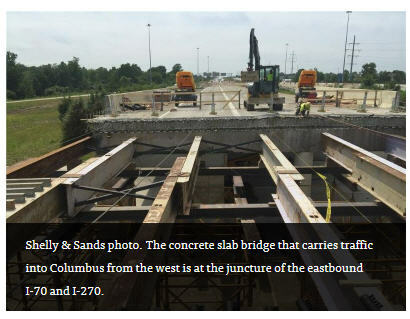 The concrete slab bridge that carries traffic into Columbus from the west is at the juncture of the eastbound I-70 and I-270. Following shutting down the affected section of highway and dealing with the fire, ODOT staff quickly put together the process to prepare a contract for bids. The tender was made on the day of the fire and of the four companies that submitted, S&S was chosen on July 2, with the 30-day completion period beginning on July 3. S&S also was awarded a cost plus contract for the building of a crossover on I-70. The crossover work, when completed, cost ODOT $653,000. Tim Keller, ODOT’s bridge engineer, brought on for the emergency work, had not seen such damage before. 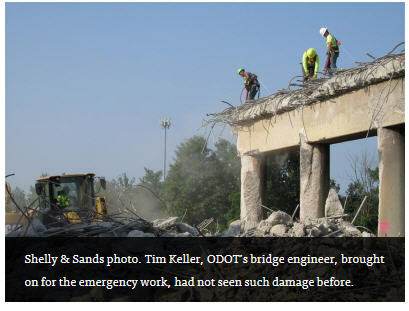 ODOT had its laboratory test the damaged materials and concrete, from the deck and cores from the columns and reinforced steel — the day after the fire, and it had the results the next day. ODOT continually tests and updates its concrete formulas and it does not place a fire retardant in the mixes. Shelly & Sands assigned Robert Hunt Jr., senior bridge engineer, to manage the project. Tom O’Brien, another S&S bridge engineer, was on site first for the firm on July 1 and as of July 2, both engineers were involved with the project. The S&S bid was submitted at 2 p.m. and at 2:15 p.m. Hunt and his staff had their first meeting with the ODOT, and at 3:30 p.m. a meeting was held with the ODOT bridge engineer on site. “By 6 p.m. a consensus was reached as far as the best way to accomplish their goals as quickly as possible,” said Hunt. “The owner changed the scope based on our suggestions and developed a plan that could best suit the availability of materials and accelerate the project. This was over the July 4 weekend and there were no materials available. The crossover work, completed in two and a half days via 24/7 work, was given to S&S as the fire was burning. Although S&S had 30 days to do the bridge work, they opted for 24/7 shifts to get the bridge job done more rapidly. “We expended over 200 man-hours per-day,” he said, noting that the crews ranged between five and 15 men depending on type of work being done. I was asked at one point during an interview ‘why don’t we do this all the time?’ It’s important to understand this project was an exception to the rule and that the industry could not sustain a pace like this on all projects. 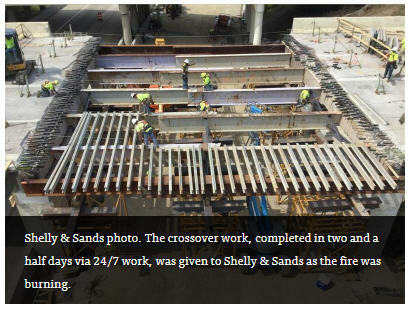 Two subcontractors were brought in for the bridge work — one to erect the reinforcing steel in the deck and another, Vasta Construction, to install the carbon fiber wrap on the pier columns and caps. For the crossover work, various small subcontractors were brought in for striping, milling, etc. The bridge work and damaged pavement under the bridge required the use of 530 cu. yds. (405.3 cu m) of concrete, and 50 tons (45.3 t) of reinforcing steel. The crossover work, led by Jeff Harper, project manager, placed 1,525 tons (1,383 t) of stone and 2,575 tons (2,336 t) of asphalt in 2 and a half days with a crew varying between 15 and 20. The crews demonstrated their abilities to deal with emergency situations and put their skills to the test. Hunt stressed the roles of Josh Edwards, the onsite superintendent; Tom O’Brien, the onsite project engineer; and Ryan Grezlik, the general bridge superintendent for the bridge project. O’Brien, who joined the company in 2008, has worked on many bridge projects. Grezlik, a 13-year veteran of S&S, looked forward to the challenge. “The initial mobilization of needed equipment over the July 4 holiday was the biggest challenge we faced in getting a good start out of the gate,” he said. Mechanics were on call to repair any equipment for both projects. For the bridge work, S&S assigned a Hitachi Z-450 excavator with a Genesis GRD-400 cruncher; Cat 220 and 320 excavators, a Cat 930 wheel loader, several smaller rubber tired backhoes and various air compressors, manlifts, forklifts and light plants. “There was a lot of jackhammer work,” said Hunt. The crossover work had operators using a wide variety of excavators, wheel loaders, compactors, dozers, rollers, dump trucks and asphalt paving equipment. On Oct. 6 Keller and Hunt presented a lecture on the bridge work at an Association for Bridge Construction and Design (Central Ohio chapter) and American Society of Civil Engineers (Central Ohio Section) luncheon. Keller noted that the repair work was standard, but that the lessons learned for ODOT was the importance of communications. “We had a couple of missteps at the beginning,” he said, “but those were resolved and the process was successfully done between our public information officers (PIO). A lot of people wanted information all at once and our District Deputy Director Ferzan Ahmed and our PIOs did a great job. It was always ‘communicate, communicate and communicate’ and in an emergency, it’s very true. Everybody understood where we were going and the targets that we had. So far ODOT has not received any requests from other DOTs and concrete manufacturers about the results of the tests of the damaged materials, but Keller said that this could be due to news of the incident remaining local.